Added on 11 February 2014 by Lurler. As promised I am continuing with the ships of VoidExpanse. Armor: Light armor, Light structure. Description: Very spacious cargo holds is what makes traders and miners use this ship more than anything else. It could fit as much cargo as several other ships of similar class put together. Generally a very good choice as one of the starting vessels for miners and traders. Added on 3 February 2014 by Lurler. With the closed alpha test going on we are closer than ever to a solid alpha version of the game. It is holidays now and I too spent a good ten hours playing the game myself. It is pretty fun to play already but there is a lot more we need to add. Anyway, here is a short report on how the game is now. Combat feels very solid and is actually a lot of fun. 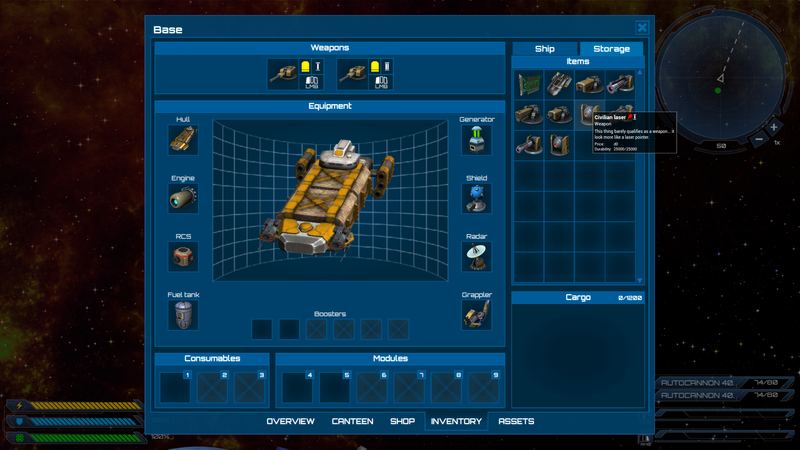 We plan to add a lot more different weapon systems and especially active devices (such as EMP generators or such). This will make combat even more different each time you engage in combat with someone. Our goal here is to make each and every encounter with enemy feel and play different. We are super happy how skill system in general turned out. It is extremely rewarding advancing your character down the skill trees and getting more and more stuff available to you. While still a placeholder it is fully functional now. The way asteroid mining works now is you extracting minerals from the asteroids directly by using different mining equipment. You can make a decent money and get some extra EXP for your character by mining. Later during development we will completely overhaul this system though. We plan on adding many other interesting steps to this process such as refining of ore and such. Aliens. You can now actually rid the galaxy of them. It is possible to visit their systems and work your way through their territory and slowly liberate all systems controlled by them. I will not go into more details here but it's pretty fun fighting them. Here is a little screenshot though. Networking is really good now. The game runs perfect even with 200-300 ping. We spent a good deal of time polishing the protocol and switched from TCP-IP to UDP. The game is progressing very nicely. We are super happy how everything develops! And I hope you can soon enjoy the game too! Added on 21 January 2014 by Lurler. Almost two weeks passed, huh? Anyway, we have a new category for the blog. 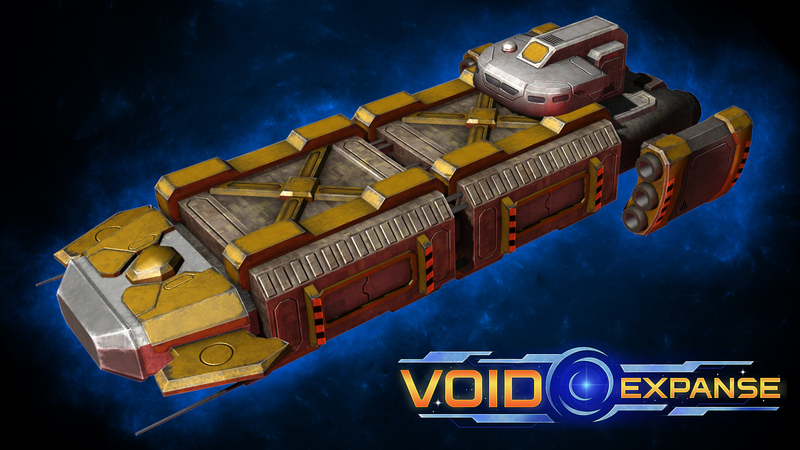 From this post onwards we will occasionally post a review of the ships in VoidExpanse. 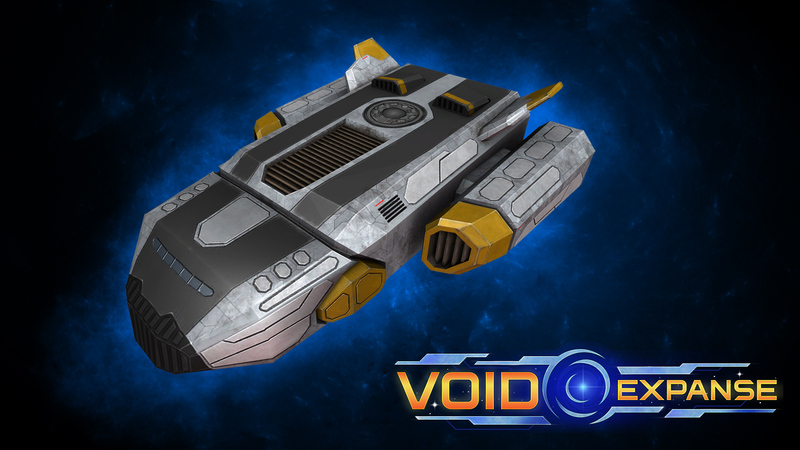 We will start with the first ship that you will see in game - Shuttle. Armor: No armor, Light structure. 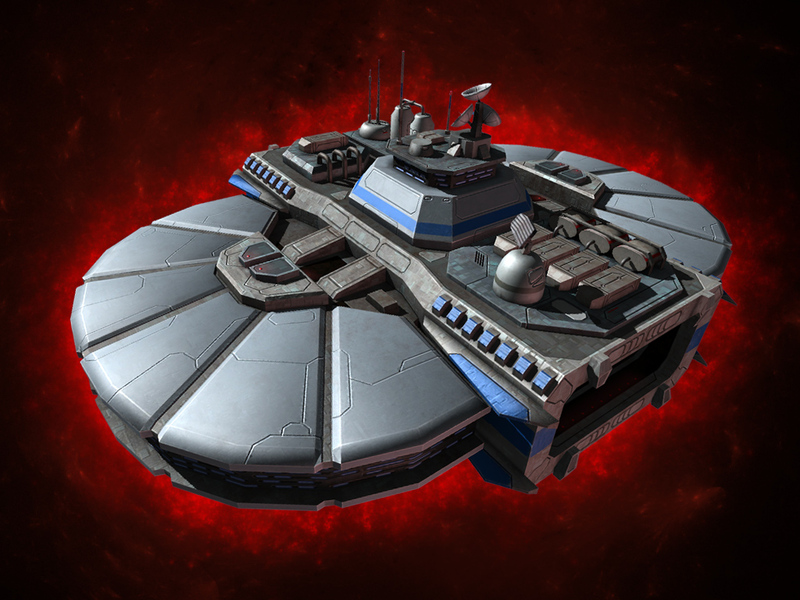 Description: It's design is one of standard civilian ships. As a result it is only outfitted with basic energy hardpoint and not a lot of other systems. Being a starting ship it is practically free and extremely easy to maintain, but it would be a good idea to replace it with something more serious as soon as you have enough money. Added on 8 January 2014 by Lurler. In preparation for our first closed alpha test (which you can be part of!) we are finishing with the sound system in the game. But who would have thought that it would be one of the most difficult things to do? The problem is the dynamic sounds for equipment. We made really powerful system to create weapons and other equipment for ships, but with it we made ourselves a major headache to sync all the sounds to actions performed by these items, since everything is dynamic and cannot be hard-coded as normally done in games. But oh, well. I am sure we will figure out how to best solve this problem in the end! For now here is another screenshot of the game. Added on 2 January 2014 by Lurler. New main menu. It is still work in progress, but even what we have now is way better than what we had before! 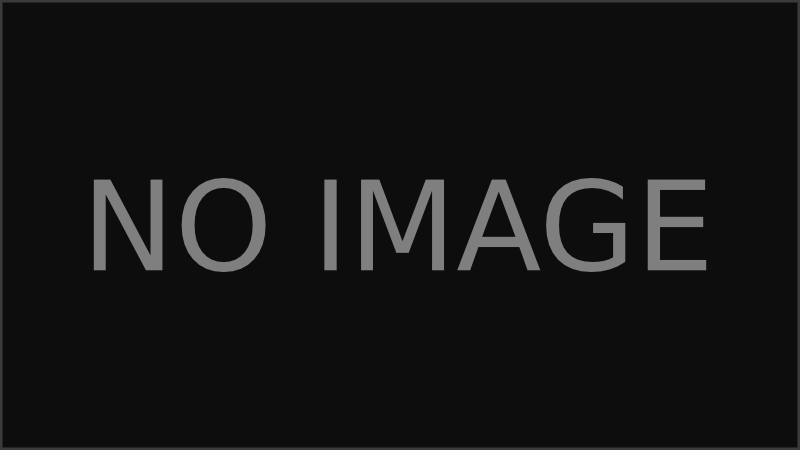 The background is animated with a ship flying through space. New galaxy map. 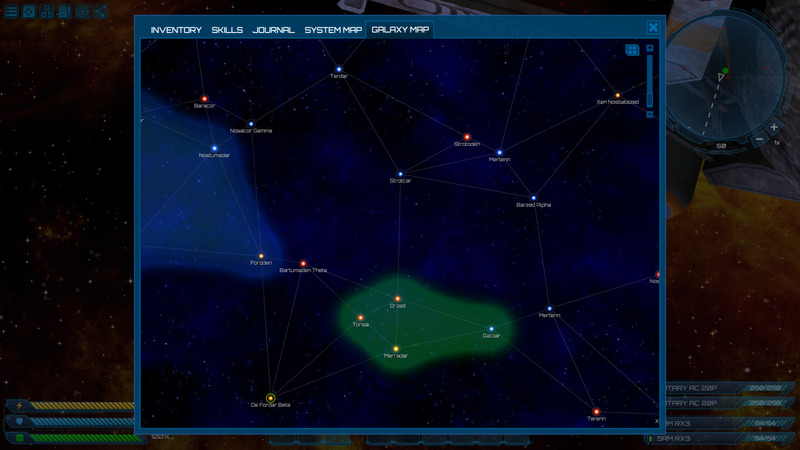 As you can see it shows factions zones of influence and other information such as system names. You can hover the mouse over a system to see even more information. New system map. There is not much changes compared to previous version, but it looks way nicer than before. Aliens! I won't reveal much information about them, because I don't want to give you any spoilers, but here is one of their ships. Conquest system is finally working. You can visit alien systems, do *something* to reclaim them. Completed skill view and a whole lot of new skills for piloting category. Also a new skill system. Skill effects are divided into three categories for even more broader effects and ease of modding and extending. Whole lot of new quests. For now these are only the quests you can take multiple times. We will work on the main plot later. Fancy galaxy generation / loading screen with status updates. 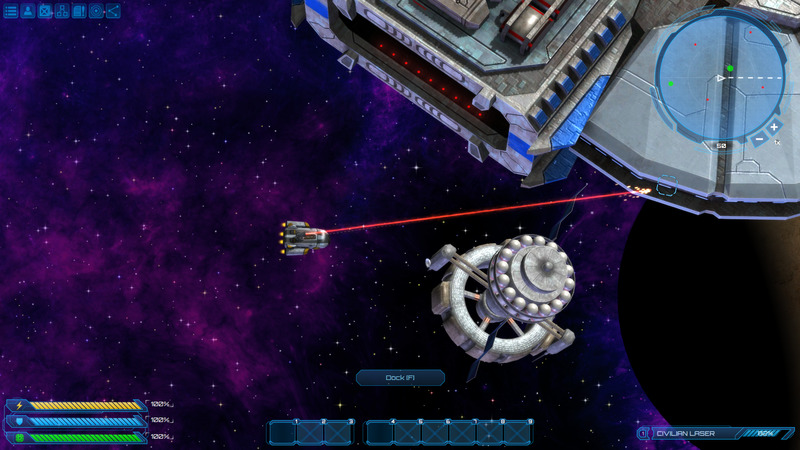 Static turrets that defend some objects such as stations. Optimizations: reduced memory footprint, some other optimizations. Other things: alien hives, completed hud, automatic docking to stations, visual jumpgate effects. Added on 24 December 2013 by Lurler. As you might have noticed there hasn't been much updates on the blog lately. The reason for that is simple - we are working on a biggest update for the game to date. That update will signify our first build that we will start showing to people with confidence. Here is a small preview of the skill tree, but I will post a big update with bunch of screenshots and info once we are done. Hopefully it will be within this week. Added on 17 December 2013 by Lurler. We are finally done with the current version of user interface for the main game screen! Ship stats on the left - energy, shield and armor bars. Quick access bar in the center - which allows you to use consumables, such as shield boosters, and devices, for example mining gear or EMP generator. Weapon groups on the right - where all weapons which are equipped on your ship will display its information. All weapons are divided into three groups and can be fired separately at will. 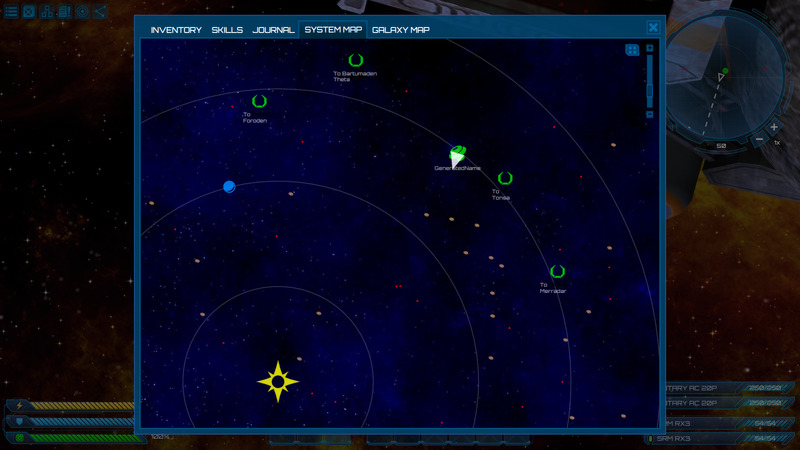 And finally radar - it simply displays all objects that are near your ship. And that is it. I think it looks quite good already, but we will still polish it more to make it look even better. Added on 13 December 2013 by Lurler. Anyway, we will work twice as hard on the next monday then! Added on 6 December 2013 by Lurler. So, I decided to rename them to just "development updates", I think it would be more interesting if we post them less often, but with more interesting updates on the progress, rather than just listing things from our logs. Anyway, in these past three weeks were able to implement really a lot of new stuff. Quest window with quest log and journal. You can see what quests you have at any time and their progress making it much easier to be aware of your progress and goals. New engine and RCS trails system, with exhaust colors depending on the engine, and indicator lights, or as we call them "blinks". You can see example of these in our previous post. Finally completed the target lock system that we mentioned in previous posts. Now you also get extra information about the target in a small window after acquiring the lock. Options window where you can setup everything you need. We also implemented the ability to change graphical settings and optimized performance a whole lot. The game can now run on low-end/integrated GPUs. For example with Intel HD Graphics 2000 it is able to produce 40 FPS, which is pretty good. Better interpolation of movement data, meaning that now you can play without any problems even with ping as high as 300 ms. Finally added items bar for quick access to consumables, such as shield boosters or special equipment, for example EMP field generator. Started work on a new jumpgate system. It will function in somewhat similar way to how it is done in EVE online. But with a twist. Repair and refuel now possible on stations. Tons of new icons for items and weapons. Cruise mode for the ship. In this mode you get twice the normal speed, but almost impossible to steer. This mode is great if you need to travel long distances within the star system. We have also added warp-jumps that are great in combat for avoiding projectiles. Music! We got a deal with an awesome veteran composer. He is in the industry for more than 15 years now. And I love his works for VoidExpanse so far! New awesome planets. You can see an example of that below. And a whole lot more! The game is really coming together! Planets, click to see animated version of the pictures. Added on 2 December 2013 by Lurler. Here is a small demonstration of gameplay. Click on the picture to see animated gif version (like a short video). Please remember though that gif animations do not convey real colors, plus to make it smaller we had to use compression which degraded the picture quality somewhat. Engine trails including RCS thrusters. Shield effects on collision with the station. Light indicators on the ship (with dynamic lighting!). Planet and space station (still work in progress, though). Weapon mounted on the top of the ship. Space background with parallax effect. Added on 27 November 2013 by Lurler. I will make it short, but I would like to share our views regarding the RPG system and character development in the VoidExpanse. We had a lot of discussions about this ourselves, but the basic idea was always the same - to only add features that make the game fun! Make the game an RPG. That was, after all, our most important decision from the beginning. This would enable the player to advance their character, and subsequently the ship as the time and game story progresses. There must be a character generation when you start a game. Here is what we have so far - work in progress character generation screen. No stats for character. That wouldn't make much sense to add attributes such as "strength" or "dexterity" as in classical RPGs. We could have, of course, made that work with attributes like "reaction", "intelligence" or "accuracy", but there is just no reason for it. It wouldn't add anything to the game. What we wanted to add was skills, and a whole lot of them! Skills as in "Diablo 2 - skills"! Here is an example of skill tree in VoidExpanse. It is an example of asteroid mining tree. It is of course work in progress, but it is very close to what we will have when we launch beta. 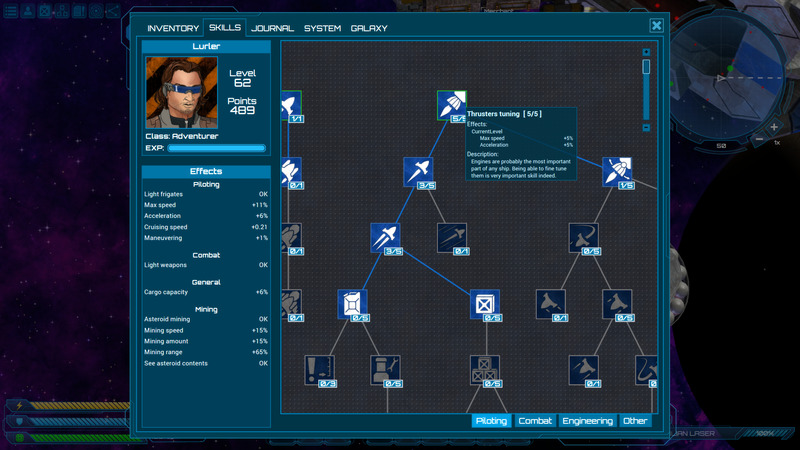 Oh, and this skill tree is procedurally generated too. 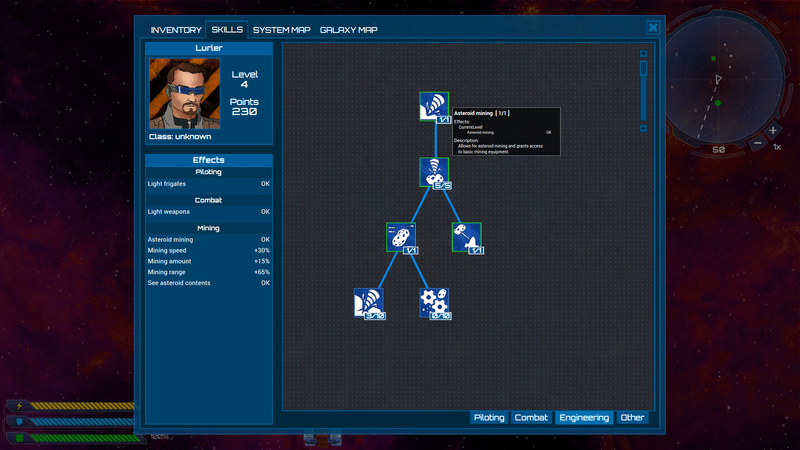 You can add as much skills as you want and the game will automatically generate a skill tree for you! That means all the skills can be modded. The skills themselves are mostly passive, granting you access to a particular technology or ability, or increasing your character efficiency with something. In the example above the first skill in the mining tree grants access to asteroid mining in general. It means that anyone can start mining quite easily, but to become really a proficient at it you will have to spend some time advancing down the tree to get better skills and increase your efficiency. Now, how do you get these skills in the first place? For this you will need to spend skill points. Each skill can cost anywhere between 2 to 10 skill points, but usually around 5. Each character level you acquire 10 skill points which means you can usually get around two skills each level. To advance your character to a new level you need experience points. You receive these from a lot of sources, for example in combat when you defeat your enemies or from missions and a few other sources. Now what about character classes and pursuing a particular path? That is interesting topic and I want to talk about character classes in details, so I will make a separate post for it. In short - we want to give players the ability to develop their character in a particular direction. But at the same time I want to allow for multi-classing. Well, I think that pretty much sums up the basics of the character development system! What do you think of all this? Do you possibly have ideas to make it better? Let us know what you think on the forum! Added on 20 November 2013 by Lurler. 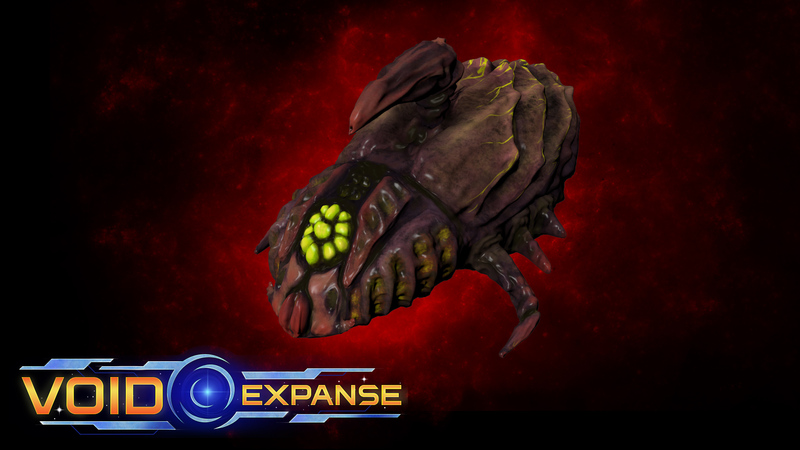 Today I decided to change the usual routine of posting only about updates to the game and do a post on a topic not directly related to the development of the VoidExpanse. Instead I would like to talk more about the game in general. So, why are we making VoidExpanse? That is actually a long story, but I hope it will be interesting to read. The idea to make this kind of game actually came to me a few years ago. At that time I was playing several great Sci-Fi games such as Space Rangers: Dominators, System Shock 2, Master of Orion 3, and a few others. I always loved the space theme and it was while playing these great space games that I finally decided to start writing a concept document for a game in that genre. However, at that time, I wasn't really going to start the development of an actual game any time soon. I was just thinking on how it could be done and what would be fun to see. The document went over much iteration over the years but eventually I was happy with it. So, how did actually making the game start? That is actually the funniest part of the whole story. In January this year I decided to start building a kind of prototype for the game just to see if the concept would even hold. I did a basic game where you could fly around in space shooting things that was a very simple at its core. Once I had the basic game made I mentioned my idea to one of my acquaintances at the time, including the idea that I might possibly make it into a big project. He was like "OMG dude, let's create a company and totally do this thing! This game sounds awesome!" You can guess what happened next! So, there we were in Singapore in February earlier this year creating a company to start a full blown development of this game and (I hope) many other games to follow. By June all of the formalities were ready and we started looking for people to join us in our new company. We immediately found two great people: Vladimir, a Unity3D god and Dmitry, C# etherlord. With their help we finally started the development on what has become VoidExpanse. A few months later Andrew, the art almighty joined us in a role of 2d and 3d artist. Now here we are, working on this great game! Added on 15 November 2013 by Lurler. What else is there this week? We are almost finished with the space stations. Shops are fully working now, and other features are almost completed too. 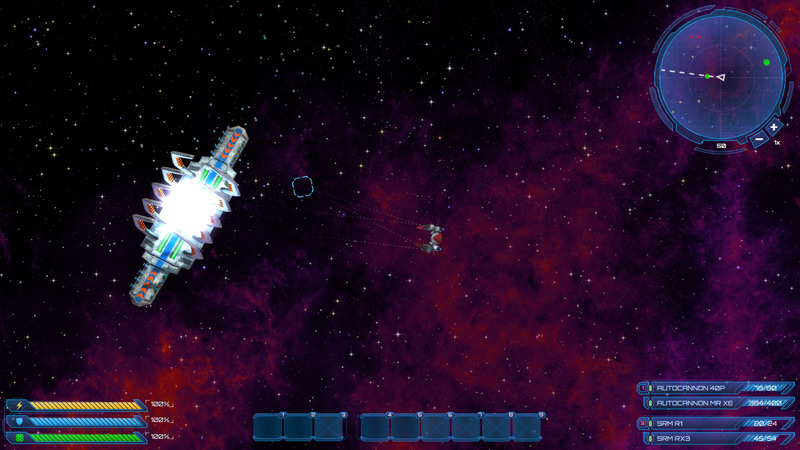 Added jettison / destroy functionality for items you are carrying. Improved shield collisions with objects. Now it will activate on asteroids and other static objects too. Implemented new NPC scaling system that would make it much simpler for us to reuse the same enemy profiles thus enabling us to create really a lot of variations even for the same enemy types. It would make game difficulty progress more steadily throughout the game. A new save system also got implemented this week. It works in an incremental way making save times almost instant. You won't even notice it in single player, and for huge multiplayer servers it could be just 100-500 milliseconds which is also perfectly okay. And finally we have improved latency handling. Now in single player there is no latency at all, and in multiplayer it is perfectly okay to play even with 200-300 milliseconds lag. Most likely you won't even notice it thanks to interpolation and extrapolation algorithms that we use. Download 1920*1080, press "save as..." on the link. Welcome to AtomicTorch Studio website! Added on 11 November 2013 by Lurler. Hi and welcome to AtomicTorch Studio website! Today is our first big milestone in the development of VoidExpanse! We are finally at the point that we feel confident enough about showing our project to people and the press. This post will highlight some general information about the game we are making and our plans for the future of this project. 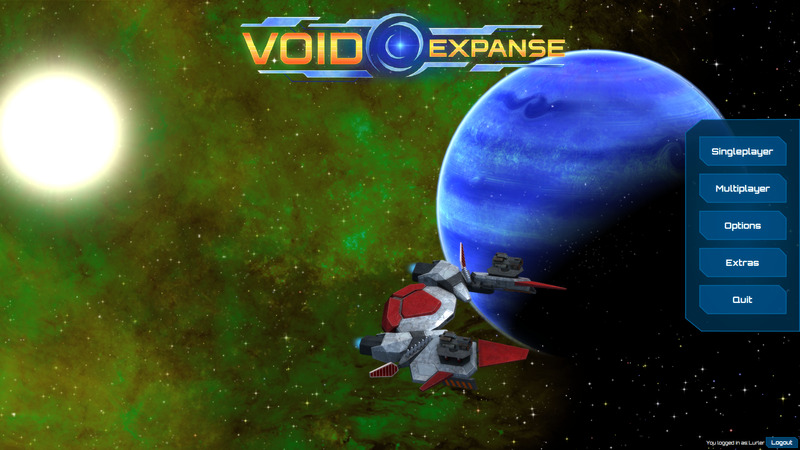 VoidExpanse is a spacefaring action-RPG with boundless freedom to forge your own path in a galaxy rife with conflict. Once, we looked to the stars with dreams of peace and immeasurable prosperity for all. We reveled in our limitless potential as we conquered space travel and ventured deeper into the unknown. Then, the aliens struck, and we lost. Faced with insurmountable odds, some of us continue to fight, while others turn to self-serving greed. Regardless of our motives, the battle for survival is only beginning. 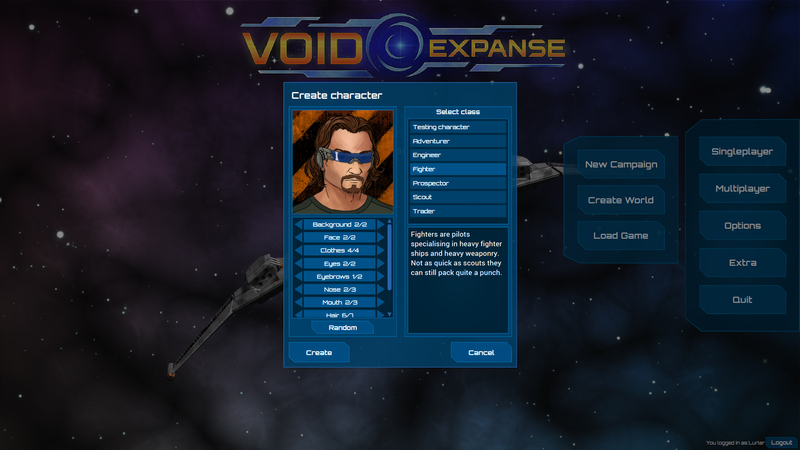 With robust skill-trees, multiple factions with their own agendas, and extensive customization of your ship, VoidExpanse allows you to truly shape your journey to defeat the alien threat and restore the galaxy. Will you be the stalwart savior of humankind, the opportunist playing every angle for financial gain, or the down-and-dirty renegade? A single-player campaign with a masterfully crafted story of open-exploration and difficult choices is only the beginning of VoidExpanse. With moddable sandbox modes, you can create your own procedurally generated galaxy to discover, or create persistent multiplayer worlds to band with other players – or destroy them. 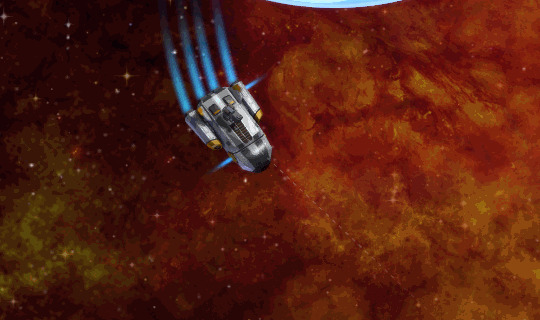 Spacefaring action-RPG with open exploration of procedurally generated galaxies. 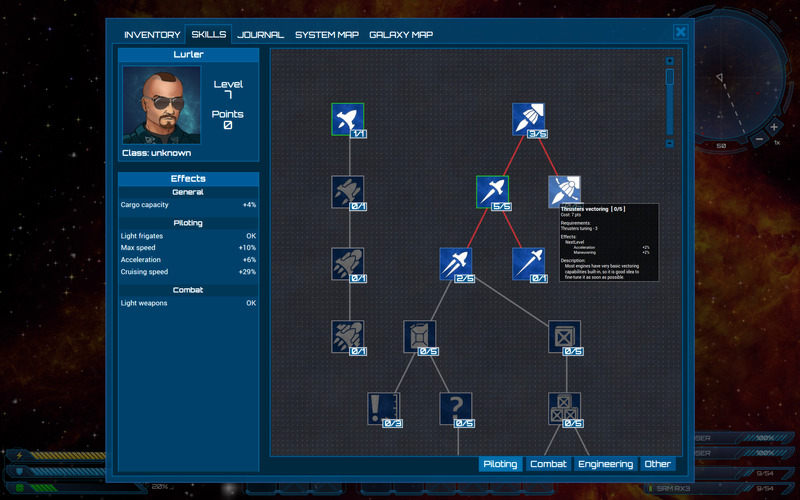 Carve out your destiny with extensive skill-trees and ship customization. 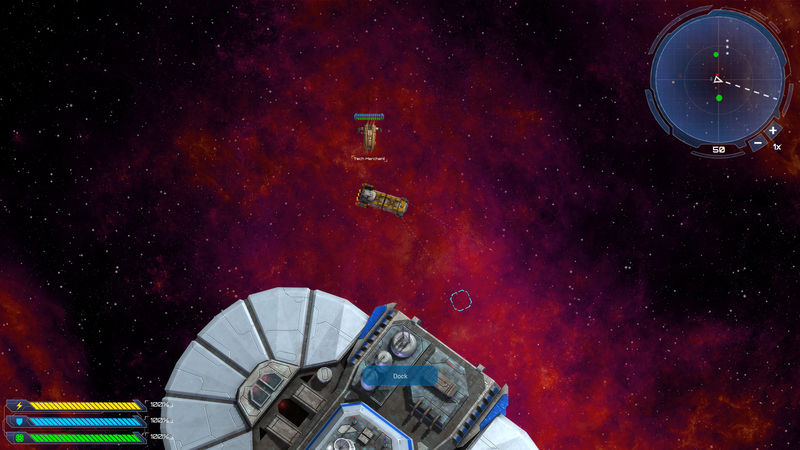 Battle, trade with NPCs, mine asteroids, and explore the unknown. Real-time combat with serious dangers; no auto-leveling enemies. 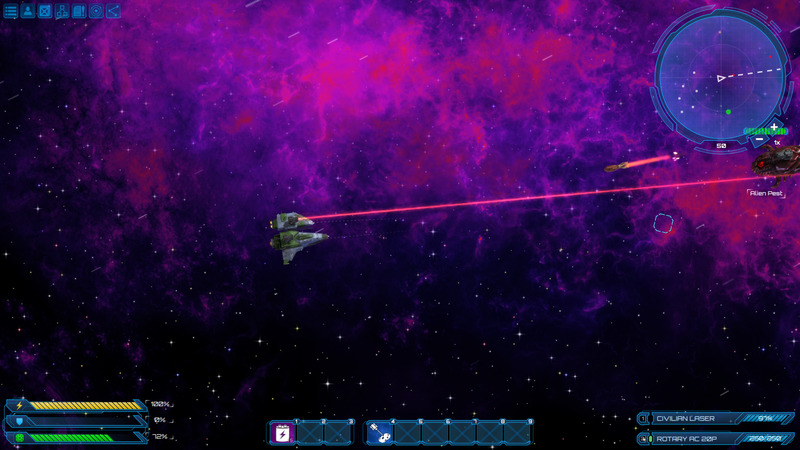 Play through a carefully crafted story in procedorally generated galaxy. Join with friends or take them on in persistent multiplayer worlds. Every aspect of the game is fully moddable and extendable. Visit our forums to discuss the game. Or like our page on Facebook. Below is a screenshot of early in-dev alpha version of the game. Everything will change upon release of course, but it should give a rough idea of what the game is like. Added on 8 November 2013 by Lurler. Hello again. It's Friday and here is another developers update! This time we finally started implementing space stations, or "bases" as we call them. 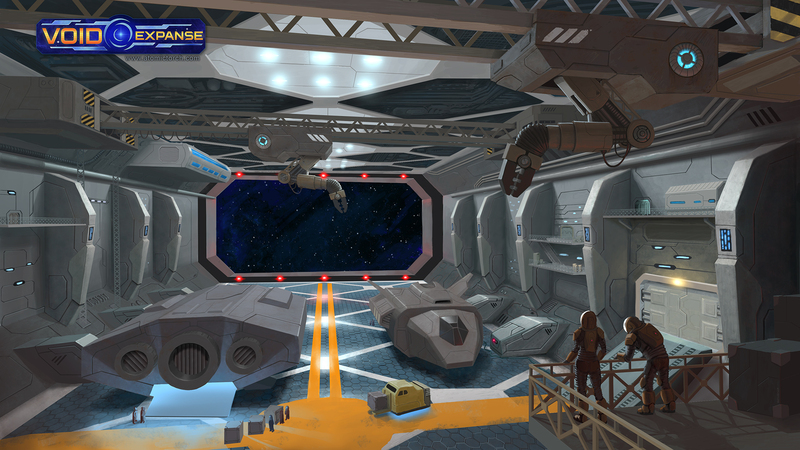 In the game you will be able to dock to many different stations and use their services such as shops, shipyard, visit canteen, etc. Different stations will provide you with different options of what you can do. For example on a mining outpost you can sell your ore for a better price. Anyway, here is a detailed list of changes this week apart from implementing the bases as I described above. Now it is also possible to change your ship hull. What that means is that you can now buy better ships with the progression of the game. Better galaxy generation. It is now all script based and can be easily changed in mods. 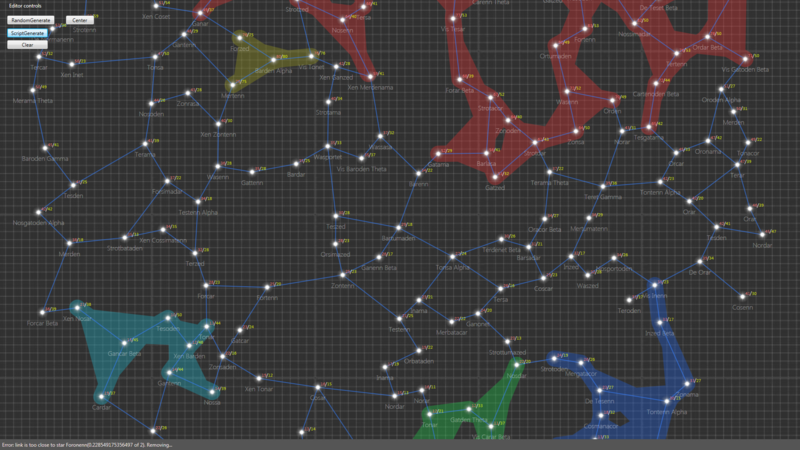 We are also continuing working on the map editor that would allow us to make the game campaign as awesome as it can be! Many enhancements to the faction system. All factions are now defined in XML files and you can add your own. You can also script any custom features for them. One of such features is that when you belong to a particular faction they will offer you better prices when trading. It will be in the game by default, but you will be able to add any other features like this. And finally we tweaked the physics of the ships a little bit. Now it is possible to precisely define the mass distribution across the hull. For example a ship might have it's center of mass right in the middle, or to the side which would completely change how it behaves in combat. 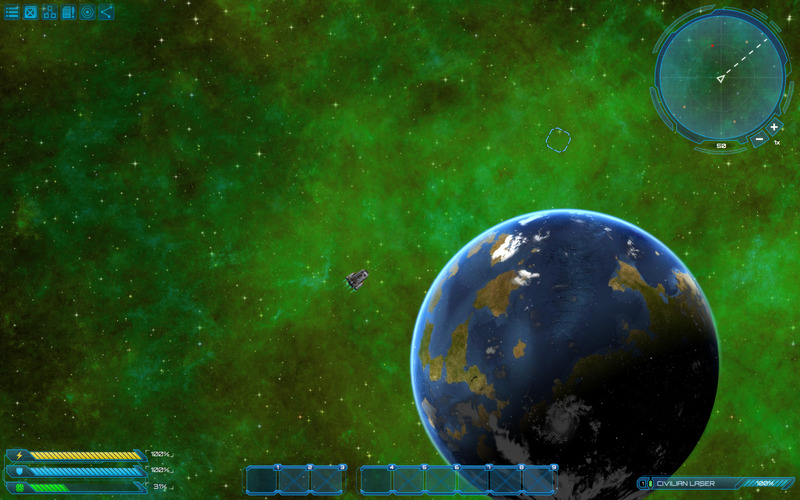 Here is a picture of our map editor in progress and an example of galaxy that it can generate. I think it is quite nice gameplay wise. Colored zones represent zones of influence of a particular faction. And here is a render of the space station.